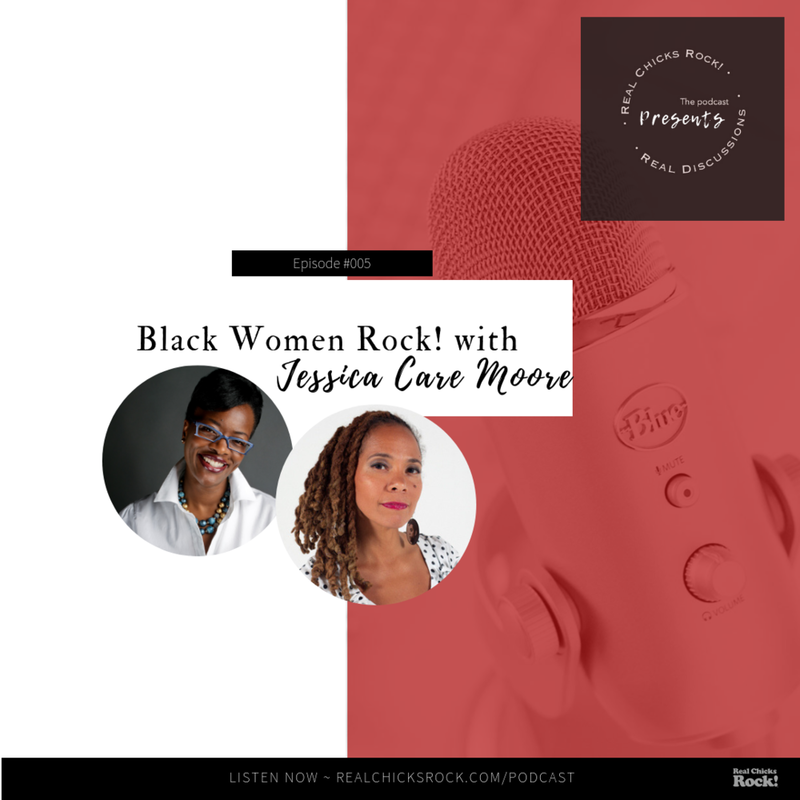 Listen to the Podcast — Real Chicks Rock!! RCR! Presents: Real Discussions ~ A panel discussion designed to give it’s audience a platform to discuss and dissect topics that are happening around us. It was an interesting and insightful conversation as Chante, Carlton, and Larmarrous shared with us their lives, how they met, journalism, design, production, their love for ALL music genres especially House, and Larmarrous's humble beginnings at DJing as a teen. Due to technical issues the last 20 minutes of the show (Pt.2) are not loaded. Take a minute to check out this discussion on my Facebook page or other social media platforms (YouTube, Apple Podcasts) SUBSCRIBE to Real Chicks Rock!™ so you don’t miss a thing. Music performed by Honeycomb Music Artist - Dawn Tallman song title 'Celebrate Myself'. This Talk Radio show aired Sunday, April 1st, 2018 on Status Network. 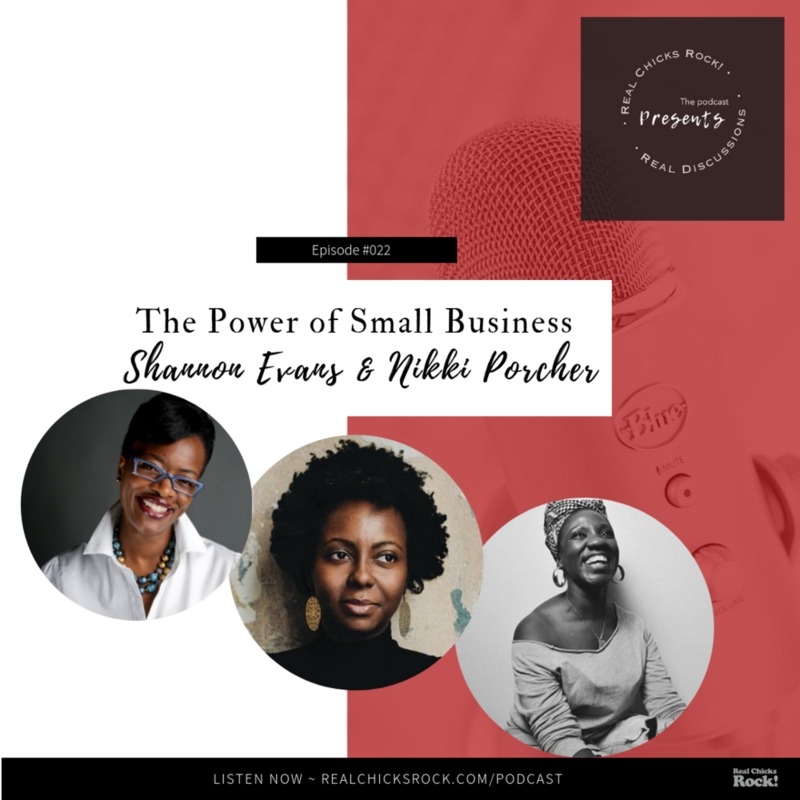 The Power of Small Businesses was the topic as we’ve had some creative, self motivated women entrepreneurs that are clear on how to stay successful in the marketplace. They both offer unique services and produces which keeps their customers coming back. Their message to the masses is not to be discouraged about any obstacles, but to keep going. They want people to think out of the box, know and believe that it’s possible. Write it down in a business plan and be comfortable in changing & updating it when needed. For more about their stories, feel free to check the show out on the Real Chicks Rock!™ YouTube Channel. ~ Thank you Status Network for time and space. ~ Thank you Shannon & Nikki for coming and sharing your professional expertise. ~ And thank you, you AND you for taking the time to like, listen and share. Much Appreciated! ~ Reach, Stretch, Grow, and Just Do It! Take a minute to check out this discussion on my Facebook page or other social media platforms (YouTube, Apple Podcasts) SUBSCRIBE to Real Chicks Rock! so you don’t miss a thing. 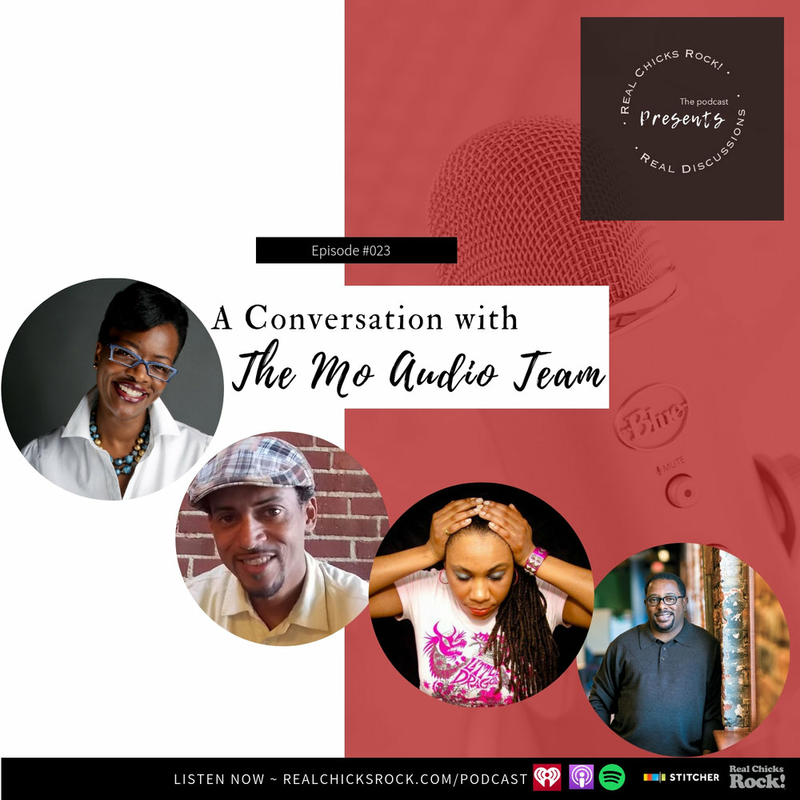 On this episode of Real Chicks Rock!™ Presents Real Discussions, we talked about what makes up a healthy relationships. 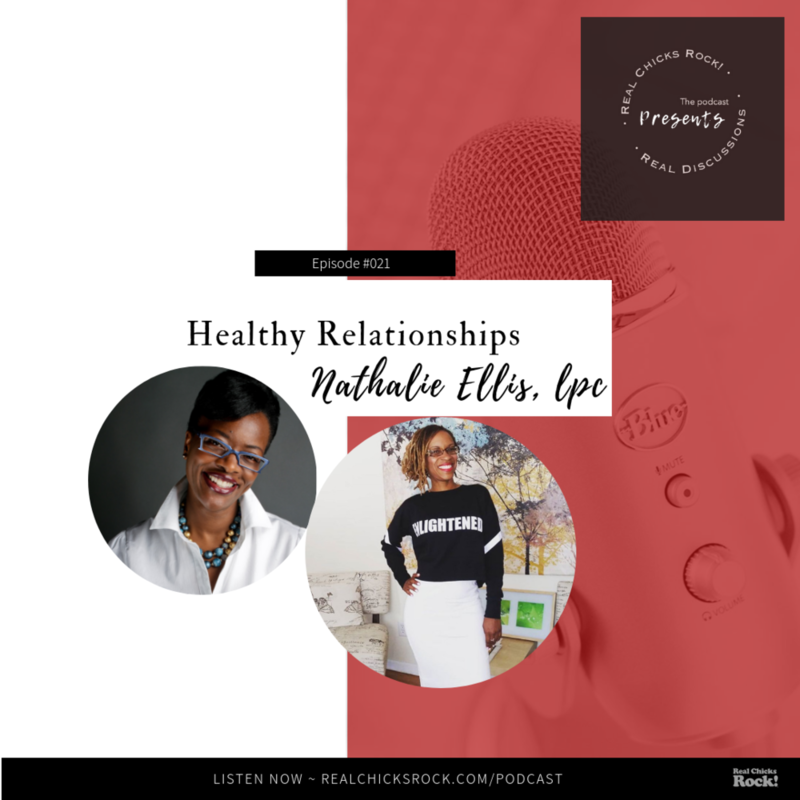 My guest, Nathalie Ellis, LPC of Esteem Counseling and Consulting Services provided us with some tools to use as we talked about the different types of relationships that we encounter. I can’t even begin to tell you how much fun it was to have this discussion. But, what I can tell you is that the root of any successful relationship begins with YOU. ~ Thank you Nathalie for coming and sharing your professional expertise. ~ Doing the same thing and expecting a different result is insane. ~ Know who you are and what you want before asking a thing from anyone else. ~ Institute self care for yourself. Real Chicks Rock!™ Presents Real Discussions has a conversation with recording artist Victory Boyd. The conversation was informative in regards to how long Victory has been a musician, an artist, and songwriter. She and her family have been involved in music for over 20 years and it shows. From playing in Central Park for 11 years to getting signed to ROCNation over a year ago. It's clear that her passion is REAL and she won't turn back now. This sweet, soft-spoken, humble and talented young lady has a way of touching your heart with every note she sings. She's an inspiration to so many, especially our young girls. With her new release of The Broken Instrument, she is taking the country by storm. Thanks to Status Network for giving us the time and space to do this. Thanks to all the listeners. And a special thanks to Victory Boyd for coming by and sharing her gifts with us. Phyllis Robinson was in the neighborhood and sat in with me for a few to have an impromptu conversation on Real Chicks Rock!™️ Presents Real Discussions. The conversation covered topics that were on our mind. From the recent hurricanes, how our government has been handling it, to homelessness and giving back to our communities. Take a peek at our chat on my Facebook page. If you missed some previous shows, go check them out on the Real Chicks Rock!™️ YouTube channel. Subscribe to it so you don't miss anything. - Be flexible and adapt to change. - What you consider to be a little, can make a big difference for someone else. - No matter how tough it gets, enjoy life as much as possible. Gotta give thanks to the guests ~ Vincent Williams and Veemo Starr who came and talked with us on RCR! Presents Real Discussions. It was a very informative conversation as to how and why they started, the importance of a business model, maintaining customers and what sets them apart from the competition. We learned quite a few things from them both and wish them continued success in their businesses. Thanks to everyone who listened in, liked the post and shared it. Thanks to Status Network for giving us a platform to have a voice. Thanks to RCR's DJ ~ DJ Kemetik for providing the hot mixes during the breaks. Special thanks to Donna Hogan for being our 1st aired commercial during the show and continuing to support Real Chicks Rock! 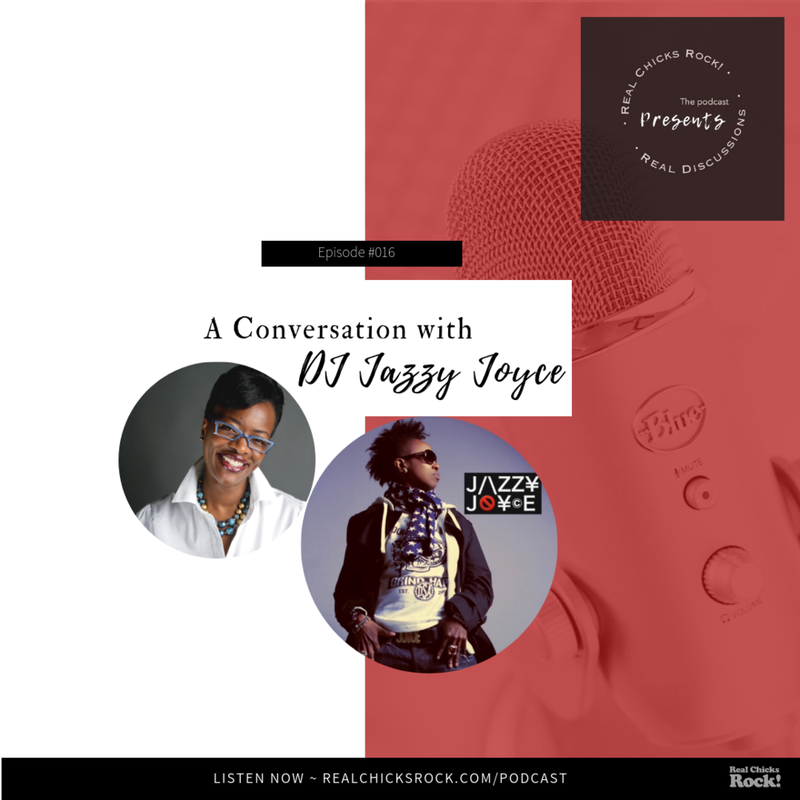 Real Chicks Rock!™ Presents Real Discussions had the opportunity to have A Conversation with DJ Jazzy Joyce. And Wow! ...is all I can say. This pioneer DJ from The Bronx shared her stories from the very beginning, to what she learned and where music is today. 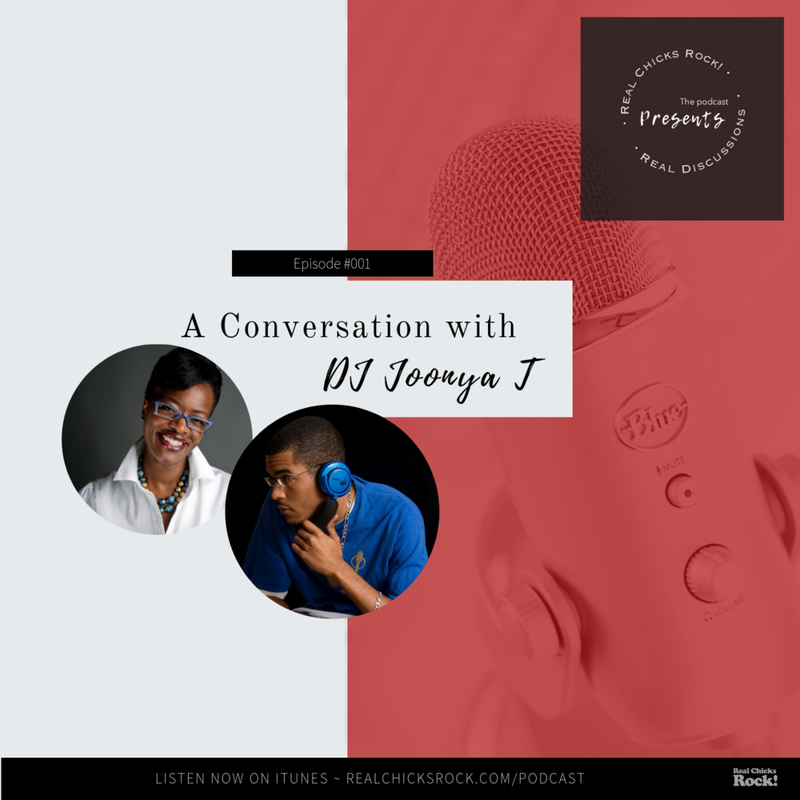 Her experiences and viewpoints are well worth the listen. Thanks to Moods Music for allowing us to have the conversation there. Thanks to DJ Jazzy Joyce for spending time, sharing and speaking life into us all (including my son). Thanks to you AND you for taking the time to listen, like, share and comment. Legends are born merely by doing what they love and believe in. Let your legendary work BEGIN. Topic: A Conversation With Kathleen Bertrand. It was an interesting, and insightful conversation as Kathleen shared with us her love of music and it began at a young age. We wish Kathleen Bertrand continued success and thank her for extending her time to us. When you place a camera in front of powerful images and allow their stories to be heard, then the creative process can begin. Real Chicks Rock! Presents Real Discussions had the opportunity of having a conversation with the talented William Feagins Jr. (Will) This Pittsburgh native has captured images of rap artists and singers for music videos and diverse subjects for his documentaries over the last several years. His commitment to focus on the people that live in Atlanta, allows us to see how beautiful, strong and passionate they really are. Thanks to everyone who tuned in, liked, commented and shared the Facebook live video. Thanks to Status Network for allowing us the time and space to have the conversation. Thanks for Will for sharing his journey with us as we wish him nothing but continued success in everything that he puts his head, heart and mind to. It was interesting and insightful conversation as Miranda with California and Atlanta as her home always being his home. Miranda shared with us her start into singing at a young age, but found a love for songwriting as her medium. Her dad owned a record store that had access to all types of music and really enjoyed listening to CeCe Peniston her favorite artist at the time. She didn't want to limit her style to just singing House Music, so she created Glamsoul. Glamsoul is a feeling, a sound and look that Miranda has developed over the years. When she sings, she wants her listeners to feel it, hear it and see it..
We wish Miranda continued success and thank him for extending his time to us. Topic: A Conversation With N'Dea Davenport. It was an interesting and insightful conversation as N'Dea shared with us her start and love of music. We wish N'Dea Davenport continued success and thank her for extending her time to us. Gotta give thanks for our guests ~ Attallah Shabazz Pamoja, Katina Cunningham and Betsy Vetter as RCR! Presents Real Discussions dealt with the Topic: Our Children in Today's Education System. These ladies brought a lot of years of educating to the table and their passion for what they do really shows. It's all about Mental Wellness! Gotta give thanks for these ladies for joining me for RCR! Presents Real Discussions. Erica James-Strayhorn, Sunnye Brathwaite, and Kay Wolfe MSc came wanting to share as much information as possible. 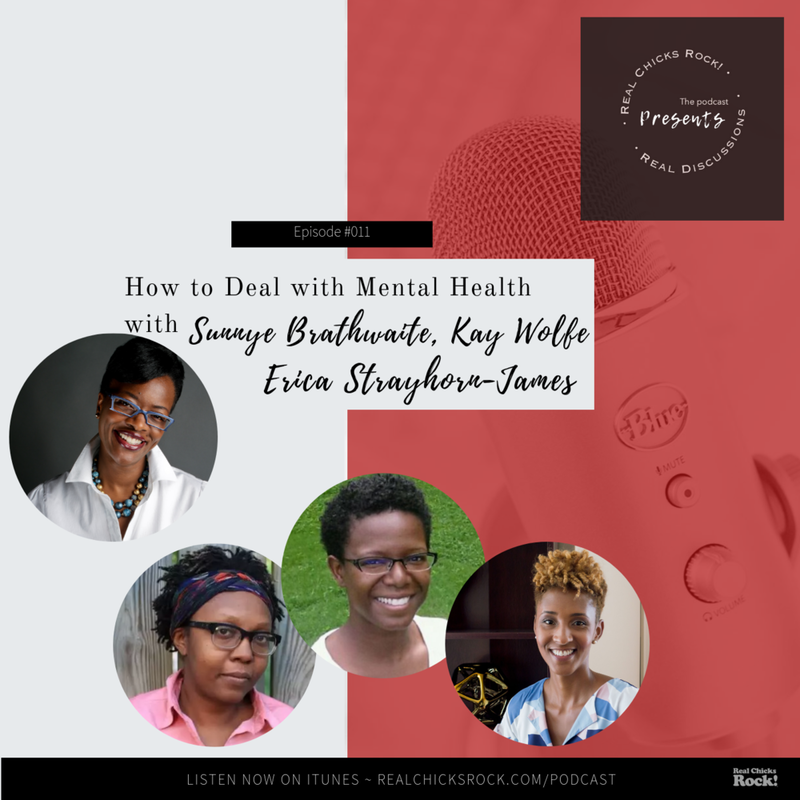 The combination of Erica's professional experience and Sunnye and Kay's personal journey made this discussion insightful, impactful and informational. If you know of anyone dealing with mental health challenges, feel free to reach out to anyone of us and we'll get the proper information to you. Thanks again to all my guests. We wish them continued success both professionally and personally. Thank you to Status Network for allowing our voices to be heard. ~ Your mental health is nothing to take lightly. ~ Make an investment in getting the help you need. ~ Words have power so, let's use mental health versus mental illness. RCR! Presents Real Discussions on Sunday was filled with laughs, smiles, and eye-opening information. My guests Fonda Clayton Smith and Joyce Reed were very transparent in their process of being an author. They identified the pros and cons as well as the process of getting your book published. Using writing and becoming an author has helped in being an extension of their voice. To Status Network for allowing Real Discussions to have a home. Gotta Give Thanks...For The Women That ROCK! Whenever extremely busy people make the time to talk with me, I’m humbled by it. This dynamic inspirational women who do it all is no different. Real Chicks Rock! Presents Real Discussions had a conversation today titled: Black Women Rock! With Jessica Care Moore. What a powerhouse. She has been a poet since a young girl in Detroit and has stopped writing, speaking or sharing the spotlight with others ever since. Jessica shared so much information about who she when she started and why. She accredits her success to the countless number of people that have supported her along the way. Thanks to my special guest today Jessica Care Moore for sharing. Thanks to Status Network for always being flexible and helping me make it happen. Thanks to everyone who listened in, liked and shared the show today. Be sure to subscribe to the Real Chicks Rock! YouTube channel and iTunes so you don’t miss a show. This show aired on Friday, April 13, 2018 at Instinct Radio. Thanks to everyone that tuned in, liked, comment and shared. Thanks to Instinct Radio for giving us the time and space to do what we do. A special thanks to my guest Josh Milan for taking the time to come and share with us. ~ To continue to put in the work because the quality is priceless. Call in to the show (470) 251-4343 Join in on the conversation - We love to hear what's on your heart and mind! Thank you for taking your time to watch this video. This Talk Radio show aired Sunday, August 5, 2018, on Lyve TV at Station Network in Atlanta. We had the opportunity to talk with the Founder of House In The Park - Ramon Rawsoul on Real Chicks Rock!™ Presents Real Discussions. Ramon Rawsoul had me tickled because his schedule during this time of year doesn’t always allow the bandwidth for lengthy interviews. Right now, he’s totally focused on having one of the biggest festivals in the Atlanta area. Every Labor Day Sunday is the day and has been for the last 13 years. Ramon shares with us how HITP came about and how he never envisioned it to be what it is today. How it was 8 DJs at the very 1st one. Now, down to the 4 pillars that hold it down each year. Check out this interview on my Facebook page now and YouTube and iTunes. Thanks to everyone who liked, shared and listened. Thanks to Status Network for giving us the time and space. Special thanks to my guest Ramon Rawsoul as we wish him more continued success. ~ Ride with some people that will make you grow. ~ Ride with some people that will hold you accountable. ~ Ride with some people that will help you leave a legacy footprint behind.